The 2001 Press Conference left people gasping – it’s controversial, provocative, and this one was the very best ever. After the introduction of all the bodybuilders by Wayne DeMilia, things soon warmed up. The highlight was SHAWN RAY eloquently debating the major issues about judging. He wanted judges changed more often and in particular, every Olympia competitor below 10th place to get prize money. The debate became red hot! You will also see a very relaxed Markus Ruhl. 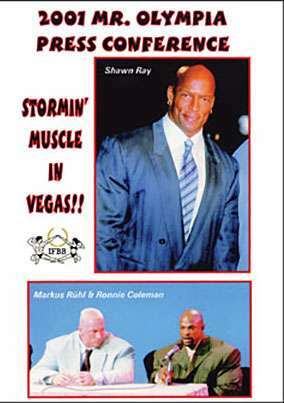 STORMIN’ MUSCLE IN VEGAS! BEING AT THIS EVENT WAS A UNIQUE EXPERIENCE! The 2001 Press Conference left people gasping – it’s controversial, provocative, and this one was the very best ever. After the introduction of all the bodybuilders by Wayne DeMilia, things soon warmed up. The highlight was SHAWN RAY eloquently debating the major issues about judging. He wanted judges changed more often and in particular, every Olympia competitor below 10th place to get prize money. The debate became red hot! You will also see a very relaxed Markus Ruhl. Dennis James, King Kamali, Darrem Charles, Tom Prince, Kevin Levrone, J.D. Dawodu, Chris Cormier, Melvin Anthony, and Shawn Ray (the final word!!) We were not able to catch subsequent Mr Olympia winner RONNIE COLEMAN for his views, but you see and hear him during the Press Conference. **SHAWN RAY vs. judging secrecy, the system, and no prize money below 10th place, etc..
**A FAN vs. DEMILIA re synthol testing etc. 19 Pavol Jablonicky Czech Rep.
Classic quote from Titus: “Kamali – I don’t like him. He’s arrogant and he’s got a big mouth”.